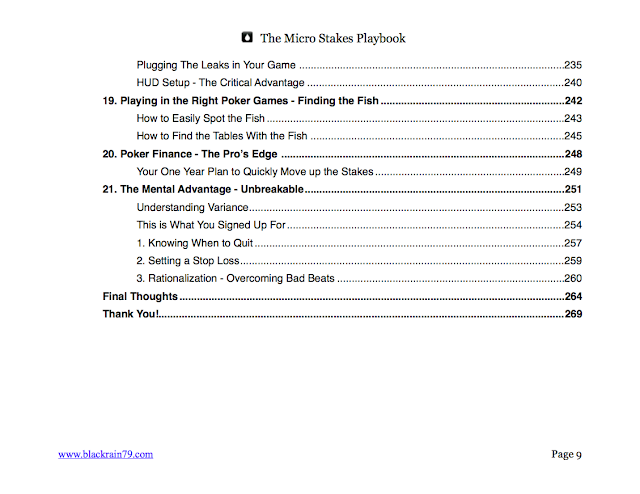 I am extremely excited to finally announce the release of my new book, The Micro Stakes Playbook. This book has quietly been in the works for a year now and it has been a massive undertaking. After the overwhelming response to my previous two books, Crushing the Microstakes and Modern Small Stakes, I knew that a final installment bringing it all together was necessary. 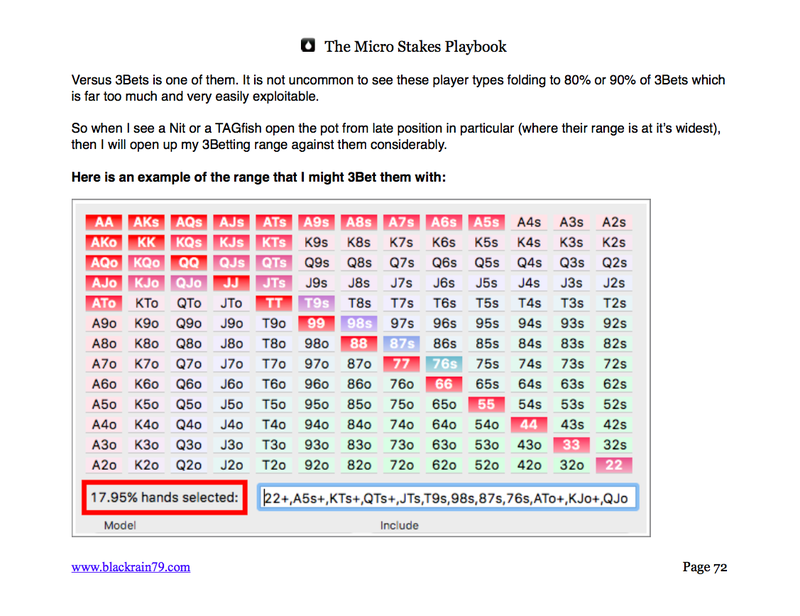 The reason why I wrote The Micro Stakes Playbook is because I still get people emailing me and commenting on my posts all the time who are having trouble beating even the very lowest limits in some cases. And when I have a quick look at some of their hands, I can see right away why this is the case. In many key situations they are making what I would consider to be the 2nd or even 3rd best decision instead of the optimal one. So this book represents everything that I have learned about crushing the micro stakes games as a professional for over 10 years now. 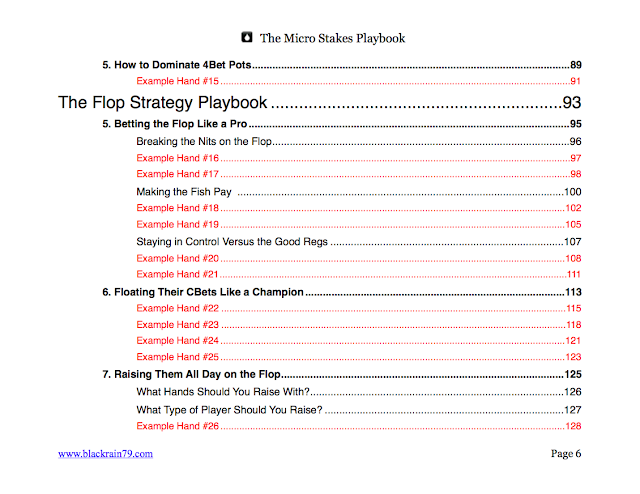 It is more or less the complete strategy "playbook" that I have always wanted to put together for the micros. That is, how to make the best possible play, as often as possible. Because this truly is the heart of winning poker. Let me start by saying that this is NOT a beginner's book. 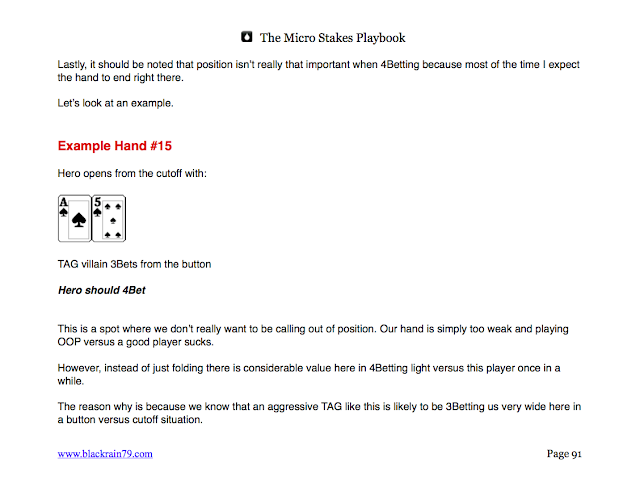 The Micro Stakes Playbook won't teach you what hands to play, how much you should bet, how to use position and so on. Teaching these basic fundamentals of the game was the entire purpose behind my previous books. 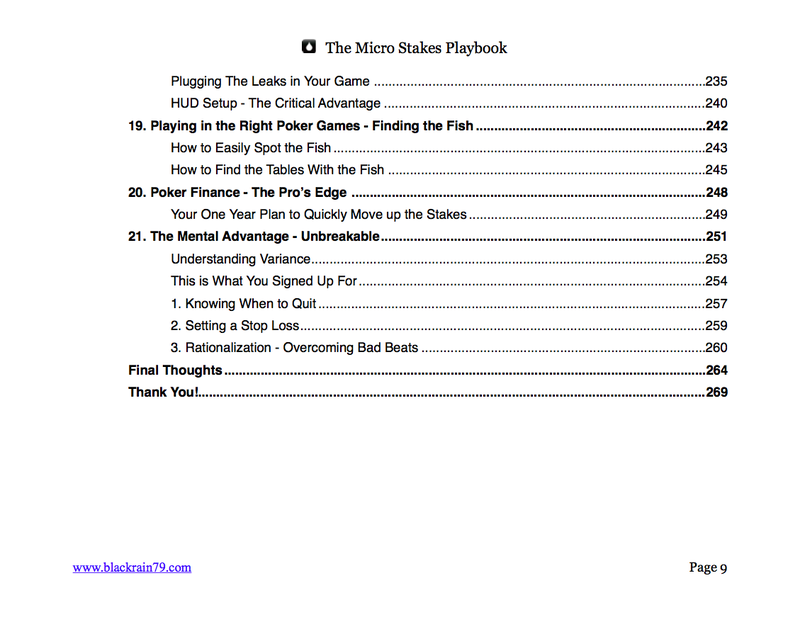 The Micro Stakes Playbook is instead a pure strategy book which consists of 21 of my best "plays" or strategies that I have used to crush the micros online for some of the highest winnings ever recorded. This book is the culmination of millions of hands of experience and experimentation on exactly what works and what doesn't in today's games. 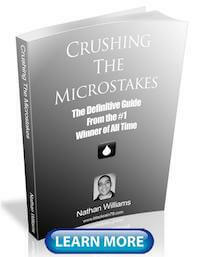 This book was written for those who are currently struggling to even beat the micros. And it has plenty of advanced strategies in it as well for those who are already winning and want to take their game to the next level. In fact, let me just show you exactly what you are going to find in the book. Starting from the beginning I break down the 6 different player types that you are going to find in these games. I show you exactly what to look for, what their weaknesses are, and how to create the most profitable counter strategies against them. 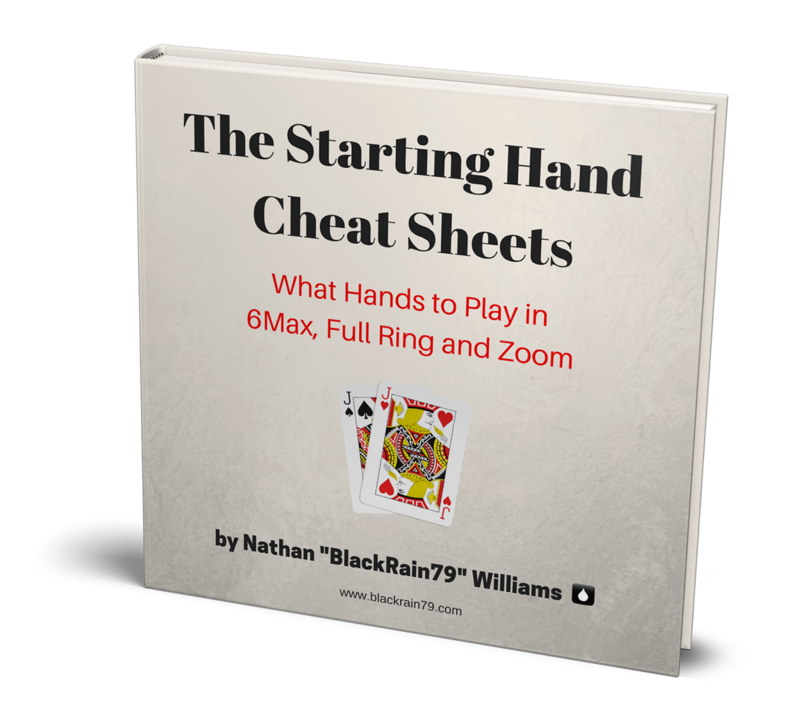 I then discuss hand reading at the micros and how to put your opponents on the correct range at all stages of a poker hand. These two things are absolutely crucial to all of the strategy discussion that comes later on in the book. 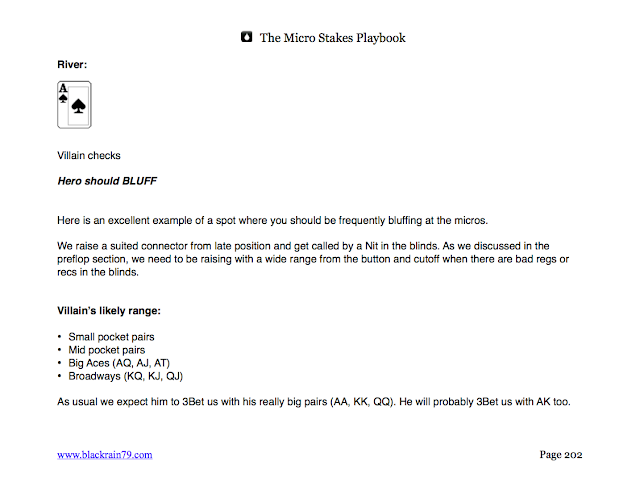 After that, starting from preflop, I break down my top 21 most profitable strategies at the micros. 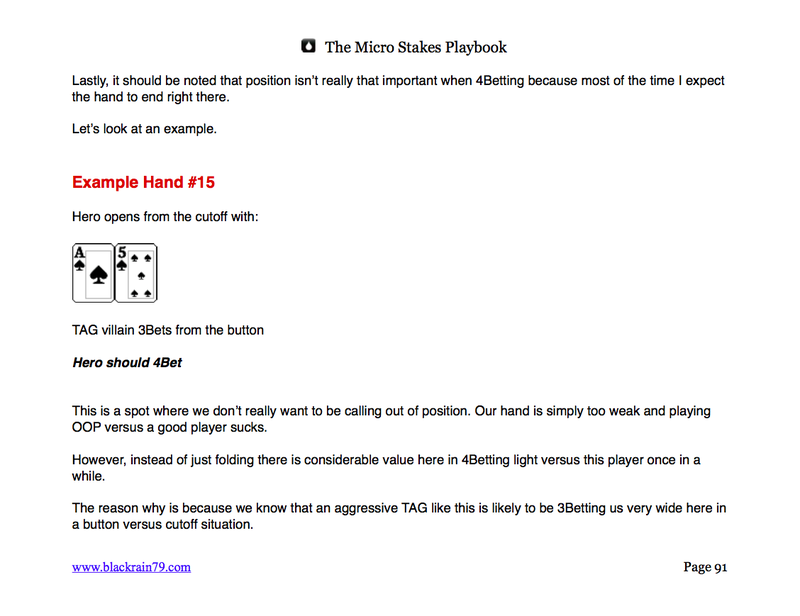 Each play is thoroughly discussed and then illustrated via the 50 highly in depth example hands throughout the book. 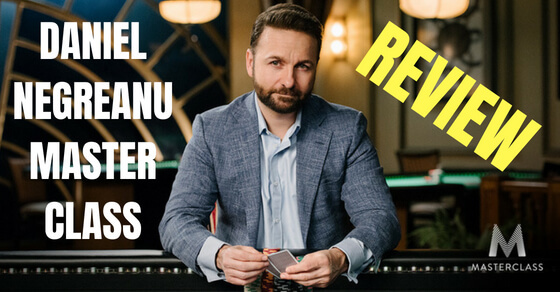 These plays range from beginner level stuff like stealing the blinds more effectively and CBetting strategies versus the regs, to highly advanced stuff like bluff/raising the turn all-in and making big multi-street calldowns versus the good regs. 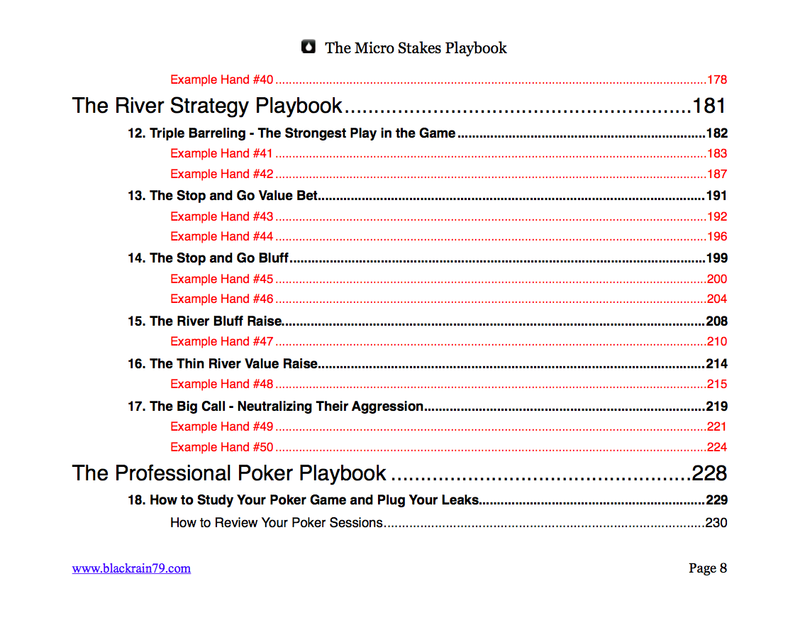 In short, this book was written specifically for the micro/small stakes game online (and low stakes live as well), and focuses solely on how to crush these games. The Micro Stakes Playbook not only covers the exact strategies that I have personally used for over a decade now to crush the micros, but it also covers many of the top aspects of the game that I know are causing you the most trouble. I know this from coaching hundreds of people at these limits over the years and receiving thousands of emails and comments on my blog posts. I have been listening to exactly what is holding YOU back at these stakes and taking notes. Also, these strategies are the result of analyzing millions and millions of my own hands in PokerTracker in order to find out exactly what works and what doesn't at these stakes. I show you how to do this step by step for yourself in the book by the way as well. The purpose behind every strategy in this book is to increase your winnings (or to get you winning) at the poker tables right now. And this really is the key difference between this poker book and almost every other one out there. I don't write "theory." I don't write stories. And I don't write to entertain you either. 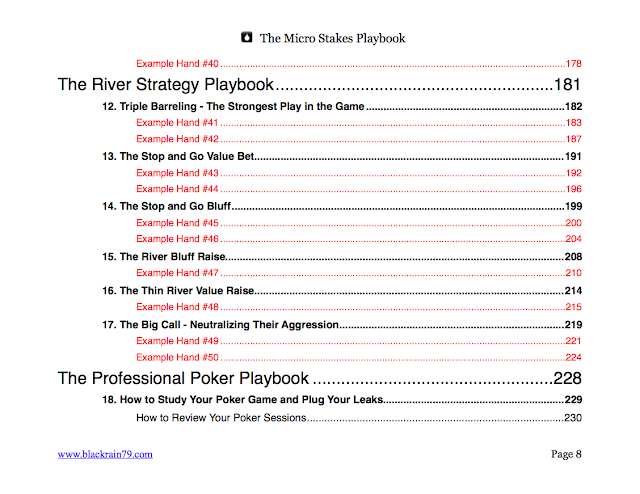 I wrote The Micro Stakes Playbook in order to improve your bottom line at the poker tables. That's it. The entire point of this book is for you to take these strategies to the tables yourself and start winning with them immediately. This is the #1 reason why my previous books have proven to be so insanely popular despite the fact that I am 100% self-published, do absolutely no marketing and only release them on this tiny little website. Results are what actually matter in this game. We keep score with money. Winning ends all doubt. And that is what my books teach people to do. The best "thank you" emails that I receive are from people who tell me how my strategies took them from a losing poker player to breakeven or from a small winner to a huge winner. They often send me their graph as "proof" as well. I want to see YOUR winning graph next! 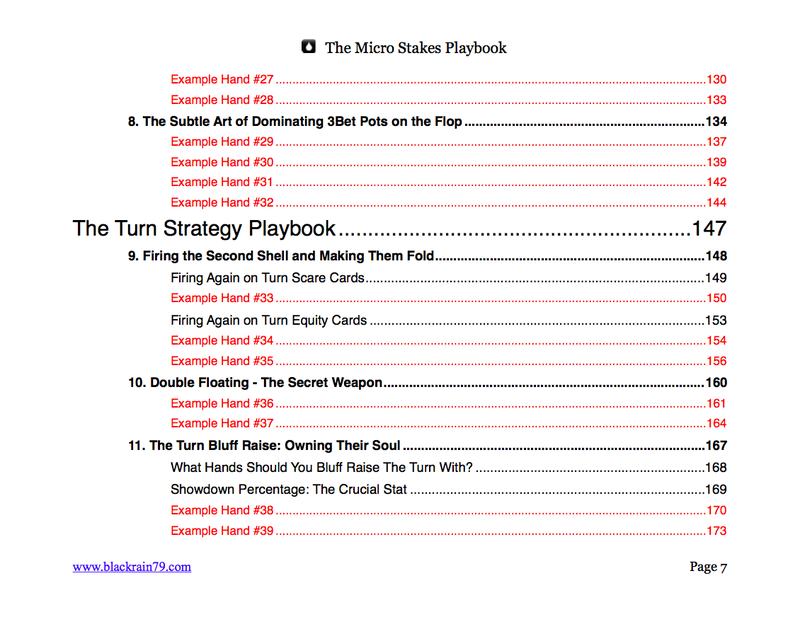 The other thing that you will notice about The Micro Stakes Playbook is that there is barely any complicated math in it, no fancy new buzz words, no "game theory optimal" strategies or other such nonsense. I get people coming to me all the time whose heads are literally spinning from all of the "theories" and complex formulas that they have been told that they need to know in order to beat the $5 games online. My approach to the game has always been a lot more simple and down to earth. And this is because I know from first hand experience that you don't need to know any of this stuff in order to crush the lower limits. This is the micros that we are talking about after all! This is where you are going to find some of the weakest players on the planet. You do not need to re-invent the wheel in order to beat them. You don't need any 10th level thinking that will go right over their heads either. What you need instead are simple and proven strategies to exploit the numerous mistakes that your opponents will make at these limits. So this is why in The Micro Stakes Playbook you are going to find common sense strategies that work against real people in real games at the micro stakes. The Micro Stakes Playbook is available starting today on my website. It is available in PDF format only for now. Mobi and Epub versions will be added in the near future. Once these are released they will be made available free of charge to all previous buyers. The other thing about The Micro Stakes Playbook is that it won't cost you an arm and a leg either. I could easily charge $100 or more for this book. 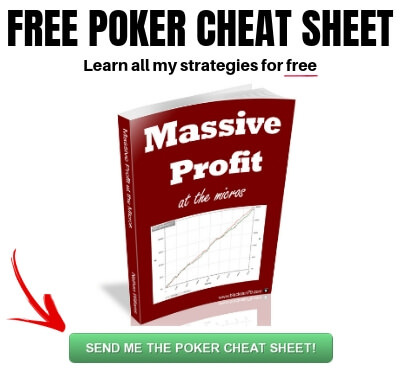 After all, I have made tens of thousands of dollars at the poker tables using these exact strategies. Click "Add to Cart" below in order to get instant access. Pick up your copy of The Micro Stakes Playbook today and you will also receive these free bonuses. 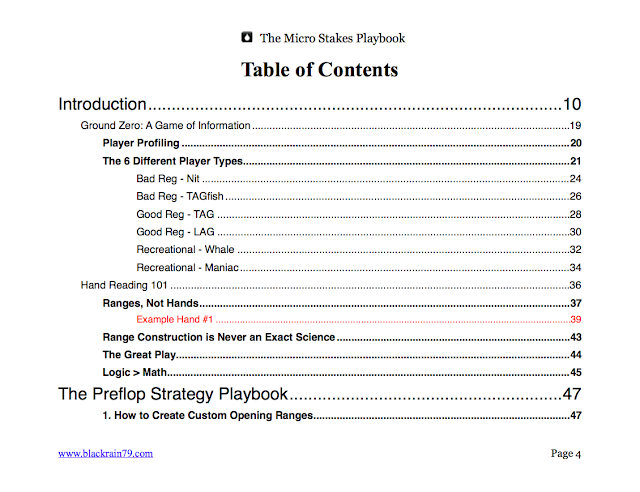 This comprehensive Zoom poker strategy book is ONLY available as a free bonus for purchasers of The Micro Stakes Playbook. I have a private forum which is only available for purchasers of my books. Here you can ask me any questions that you want about the material and get feedback on your play. You can also post your own hand histories and get advice from me personally and others as well. *Create a free account on my forum and then make a quick post in order to gain access. For the cost of only a buyin or two at the lower limits you can start learning the strategies that will quickly get you beating these games and making a nice side income (or even a full-time one in some cases) playing the game that you already love. 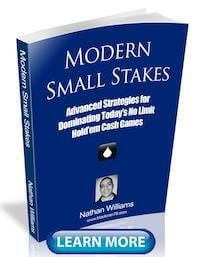 In fact with some of the plays in this book I even show you exactly how much it will increase your winnings. 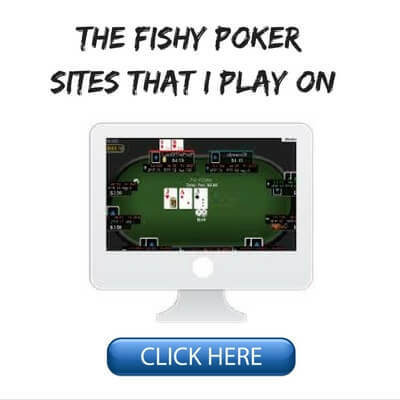 If you play poker even semi-regularly, then this can easily add up to hundreds or thousands of dollars per month. A free copy of "The Starting Hand Cheat Sheets" AND "The Ultimate Zoom Poker Strategy Guide"
Lifetime access to my private member's only forum where you can post your hands and get direct feedback from myself and others. Don't keep spinning your tires at these stakes for years on end. 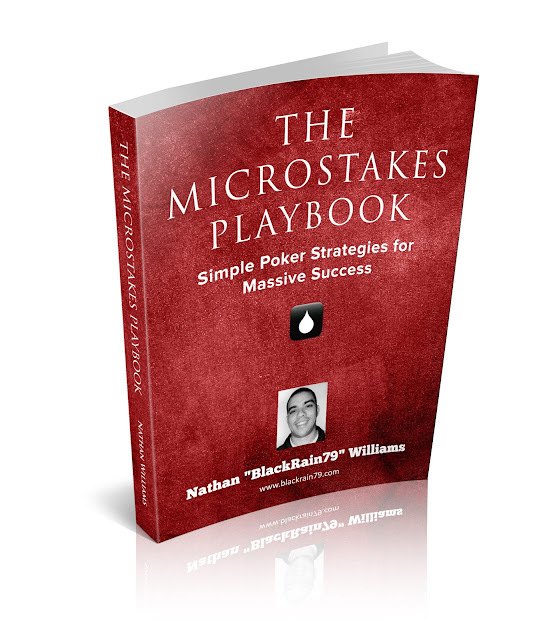 Learn the proven winning strategies today to start crushing the micros and quickly moving up the stakes. On the next screen select "Pay with Debit or Credit Card"
Writing a poker book is a little bit like climbing a mountain. Several of them in fact. The road often seems to be straight uphill and the inspiration comes and goes. This is probably why it has been over three years since I released the last one! But it is only due to you guys (and a few gals too) that I have now been able to complete this project, my third book. I want to thank each and every one of you who continue to read my blog posts every week and support my work so much. I want to thank the now 10k+ people on my free newsletter as well which is an even more mind blowing number! The encouragement and support that you guys provide me is the main reason why I am able to do this. 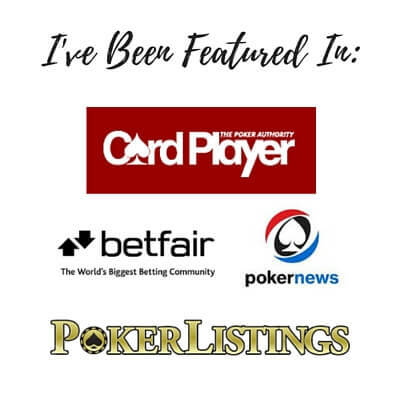 It is absolutely amazing how much this little blog has grown over the years into one of the top visited websites on the internet for micro stakes poker strategy today. Going forward you can expect the same in depth weekly articles on how to crush the micros. That really has been the bread and butter of this website for years and I have no plans to stop. Thanks as always for reading and all the best at the poker tables! 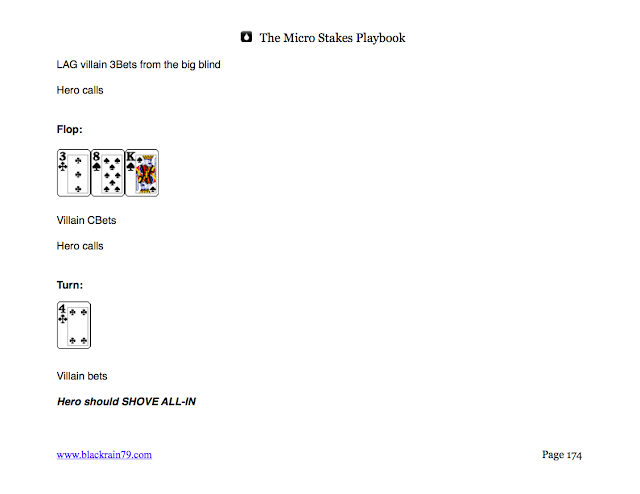 If you have any questions about The Micro Stakes Playbook feel free to leave them below. I would probably suggest this one. It was just released today and many of the strategies in the book are directly applicable to these stakes. The other option would be Modern Small Stakes. Nice work on the book Nathan, looking forward to reading it. Will you put out an email when its available on epub? Thank you! Yes, I will definitely send out an email when the epub and mobi versions of the book are available. I will put it on social media and probably write a short blog post as well. Awesome job Nathan, I have been waiting for this. Can't wait to read it! Thank you TJ and I hope you enjoy! Hi Nathan, I concur with TJ. Great job. Looking forward to the read. My new book is more advanced than Crushing the Microstakes and the video course. 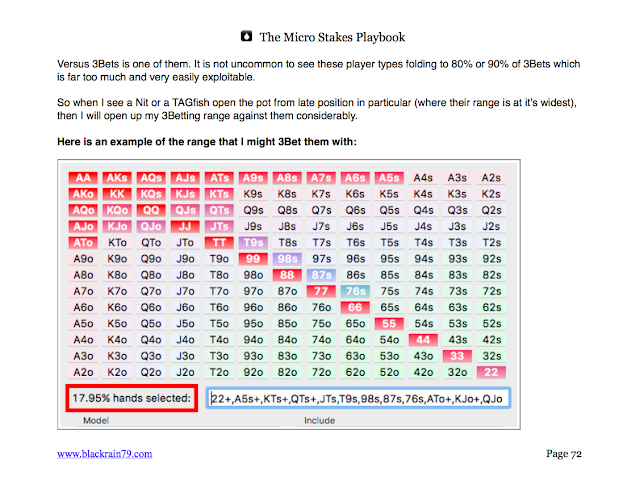 This is because it focuses on how to beat all stakes at the micros, not just NL2 and NL5. Thanks for your answer. 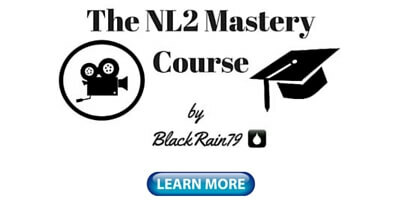 If I buy both of the NL2 Mastery video course and The Micro Stakes Playbook, can I have a Special Package Deal? Would thus be useful for small stake mttsngs ? 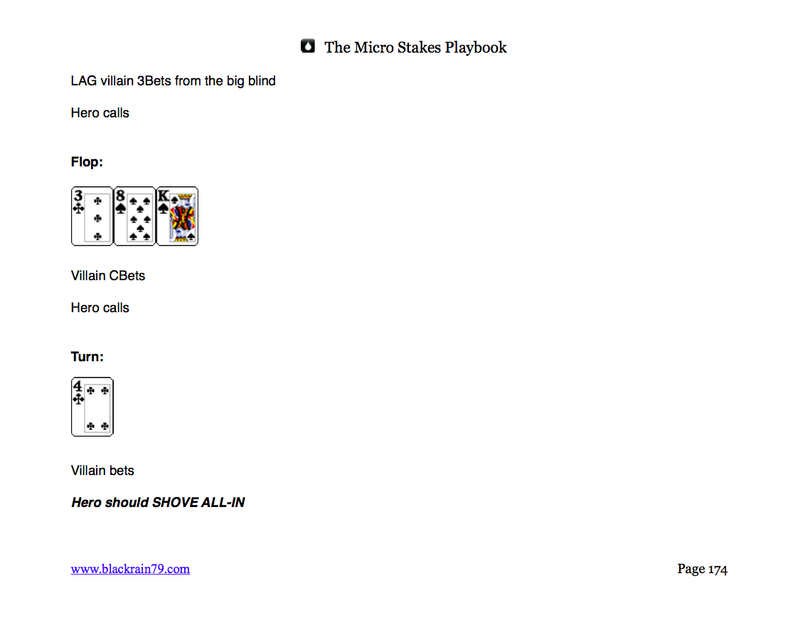 The Micro Stakes Playbook primarily focuses on cash games so I wouldn't really recommend it for mtts or sngs. With that said, many of strategies will work in tournament style games like this as well. Sorry I don't accept Pokerstars transfers. Just the payment methods listed above for now. Hey David, sure no problem. I actually just released this guide two days ago. Please send me an email at blackrain79@dragthebar.com and I will send you a copy. Great job Nathan, can't wait to study this! Please check your email, I've paid two days ago and still haven't received link for book. Thanks. Replied twice already. Can you send from another email? My phone didn't receive the mail for some reason but I just logged in on my computer and there they are. Thanks Nathan been looking forward to reading it. Glad you got it Kevin and hope you enjoy! Hi Nathan and thanks for your hard work. Glad the book is finally here. 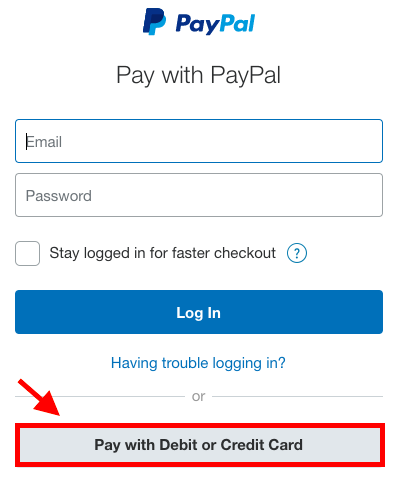 I live in Iran so I don't have access to the payment methods mentioned above. are those acceptable by you? Sorry but I only accept the payment methods listed above for now. Perhaps in the future I will look into adding something like Bitcoin. Sorry for the delayed reply, receiving a huge amount of email right now. You should have received an automatic email upon purchase. I have just sent another as well. Let me know if you still aren't receiving it and I will find another method. Hey Nathan. 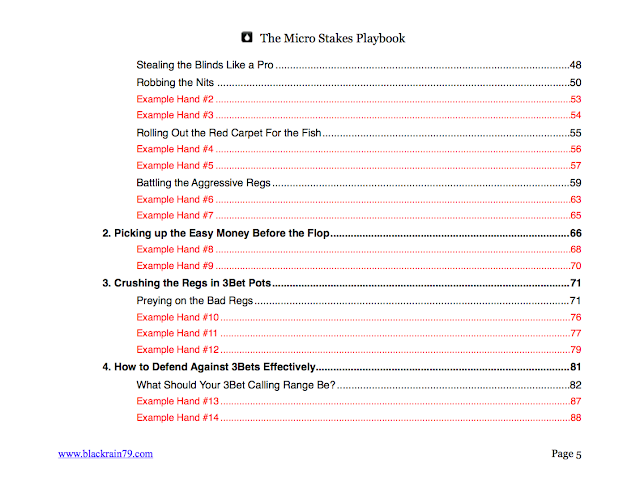 Right now im learning from your book 'crushing the microstakes'. Do you think that there is big difference beetween this and your new book? For what stakes you recommend your new book? 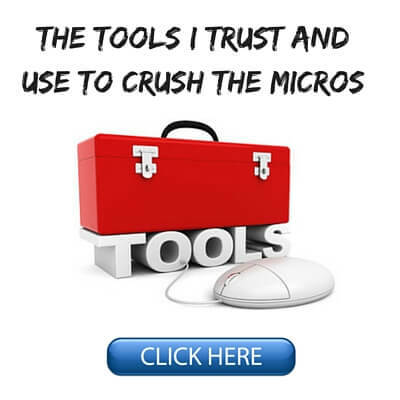 Crushing the Microstakes is excellent for beginners. It focuses specifically on the two lowest limits online, NL2 and NL5. It also teaches many of the basic fundamental concepts of the game such as what hands to play, how much to bet, how to use position and so on. 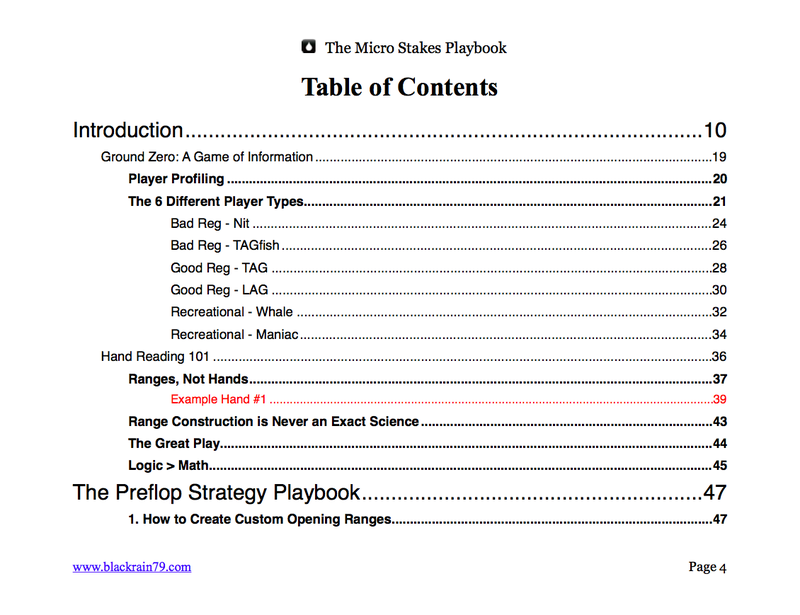 What you will find in my new book, The Micro Stakes Playbook, is more advanced material and more specific plays that you can use in real situations at all levels of the micros. There is a wide range of strategies from beginner to advanced so I think this book will be useful to anyone who plays at NL100 or lower online and 5/10 and below live. I read your post and I see you updated your post. 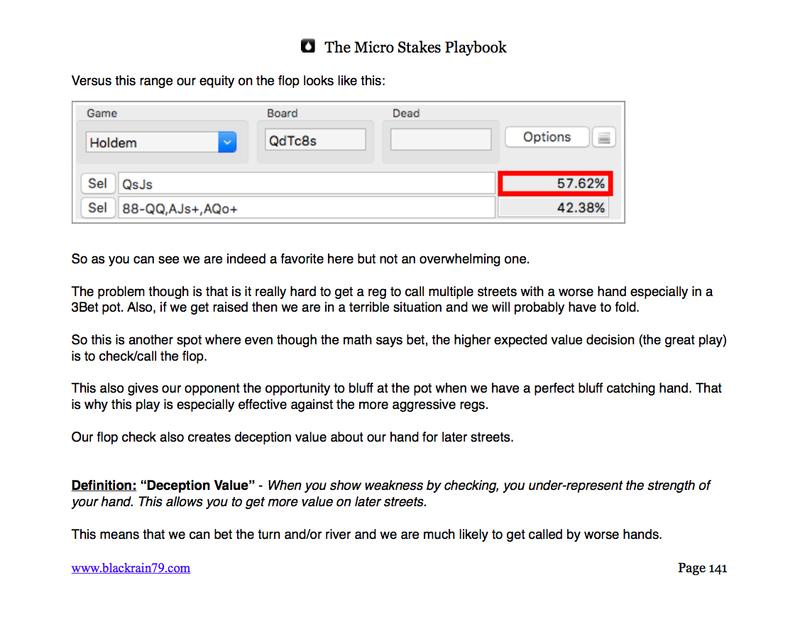 You have one more bonus for purchasers of The Micro Stakes Playbook. I bought your MSP but when I bought, it hadn't "2. 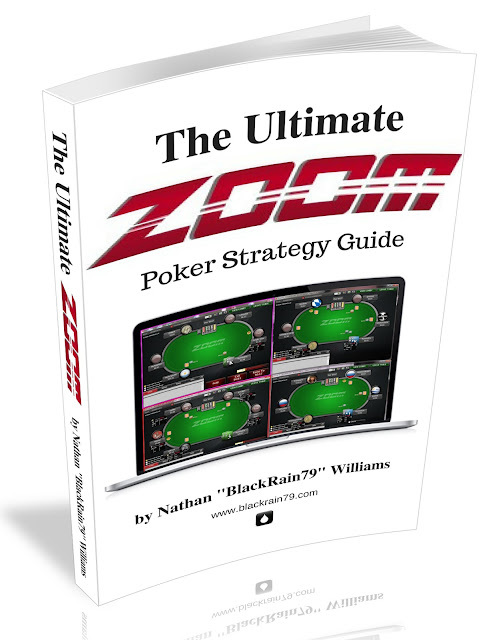 The Ultimate Zoom Poker Strategy Guide" yet, it only had "1. The Starting Hand Cheat Sheets, 3. 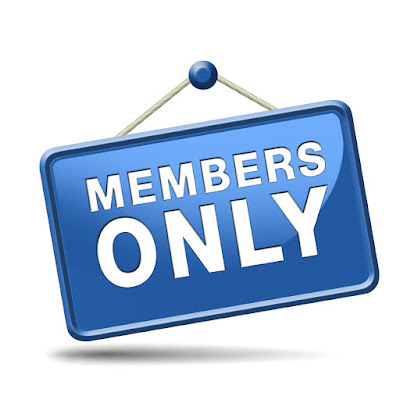 Lifetime Access to my Private Forum" . Yup it was just released. I just sent you an email with the download link for it. Yes this is an ebook. It comes in pdf for now. Epub and mobi will also be released soon. Hey Nathan I play NL 50 would this book be good for that stake?